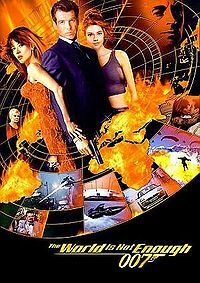 The World Is Not Enough (1999) is the nineteenth spy film in the James Bond film series, and the third to star Pierce Brosnan as the fictional MI6 agent James Bond. The film was directed by Michael Apted, with the original story and screenplay written by Neal Purvis, Robert Wade and Bruce Feirstein. It was produced by Michael G. Wilson and Barbara Broccoli. The title The World Is Not Enough traces its origins to the English translation of the Latin phrase Orbis non sufficit, revealed in the novel On Her Majesty’s Secret Service and its film adaptation to be the Bond family motto. The film’s plot revolves around the assassination of Sir Robert King by Renard and Bond’s subsequent assignment to protect King’s daughter, Elektra, who had previously been held captive by Renard. During his assignment, Bond unravels a scheme to increase petroleum prices by triggering a nuclear meltdown in the waters of Istanbul. Despite the film’s mixed critical reception, it earned $361,832,400 worldwide.